I was in one of those moods last Friday night while shopping in Tesco. You know how it goes, it was after a particularly hard week at work and I was looking to pick up a few treats. My other half was feeling a bit down as well and I thought I'd find something to cheer us both up. So I picked up a bottle of our favourite wine and then I spotted the Red Velvet Cupcakes on the end of the isle. They were in packs of two for £1. I'd sampled one of these delicious cakes (not from Tesco) about a month ago and it was like heaven on the taste buds. They consist of a moist red sponge which is ever so slightly chocolatey and a lovely creamy butter icing on top (sometimes with a few red sprinkles). I wouldn't say I have a sweet tooth and I don't eat a lot of cakes, but these Red Velvet cakes are something special and they appeal particularly because they are moist. Also, I'm not a huge fan of chocolate cakes but just a little is really nice. Anyway, I was full of expectation and looking forward to our treat later that evening, but I was about to be very disappointed. Why are these cakes described as Red Velvet Cupcakes? When I opened up the packaging what I found inside was a couple of cheap chocolate cupcakes that weren't worth a 20p never mind the £1 that I paid for them! Luckily the wine was going down rather nicely at this point and whilst it helped, it didn't completely make up for the let down. I find it quite disgusting when companies use deceitful packaging to trick customers into buying their product by promising one thing and delivering something quite different. They're basically bamboozling the consumer, tantalising them with the words they want to see and at the same time peddling a cheap, nasty substitute. The cakes looked like the real deal and you couldn't see that they were in fact BROWN and not red. Why are these cakes described as Red Velvet Cupcakes? Anyone who has tasted the real thing knows that it is a scrummy moist dark red sponge with a delicious creamy butter icing, not a stodgy chocolate cake with this cheap metallic "vanilla flavoured icing". Whilst I'll admit that the packaging did say "moist chocolate sponge", it was in a very faint red font and was overshadowed by the more prominent, "2 Red Velvet Cupcakes". It was blatantly obvious to me that this was an attempt to cash in on their popularity, either that or whoever was in charge of putting the recipe together for the product just didn't have a clue. 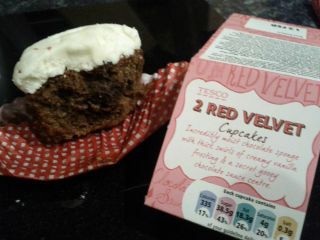 So Tesco, whilst your Gallo wine hit the spot nicely that evening, your "Red Velvet (brown stodgy)" cupcakes fell decidedly far short of the mark! "My parents didn't give me any scope to feel sorry for myself. ***They were just like ***"
What on earth do you mean : They were just like ? Is that supposed to mean something? My wife makes cupcakes not for a living but because she enjoys it and they taste and look good. Anyway these Tesco Cupcakes are terrible and to get any good quality cupcake you have to look for the independant sellers. My cousin sells them via her own online Facebook page and they are 1000% nicer then Tesco ones. Another has mentioned putting strawberries in their red velvets, my wife doesn't do this but it is certainly a good idea and will make the cupcake nice and moist. The wife sticks to colourings and has been known to put popping candy in them too, which is novel. You do know Red Velvet IS just a chocolate sponge with red food dye. Admittedly those don't look very red but the colour is just that. Can I ask, the red velvet cakes you had that were nice; where were they from and how much did they cost? Indeed the only objective of every marketing organisation is to make money. However, there are different ways of doing it. Take the motor industry - there are companies who make cheap cars, and look to sell many of them to make a profit, and then there are companies like Morgan who hand make incredibly expensive cars. Guess which are the better quality? Translating that to food - Tesco own brand "chocolate" products are not aimed at the same market as Charbonnel et Walker in the Royal Arcade on Old Bond Street in London. Advertising at it's deceitful best. All advertisers are interested in is MONEY ONLY. Did you take the packaging back and complain?